Kevan Jon Olympia serpent velvet ball dress. Features open cowl backless design with high slashed neckline full sleeves and keyhole front. 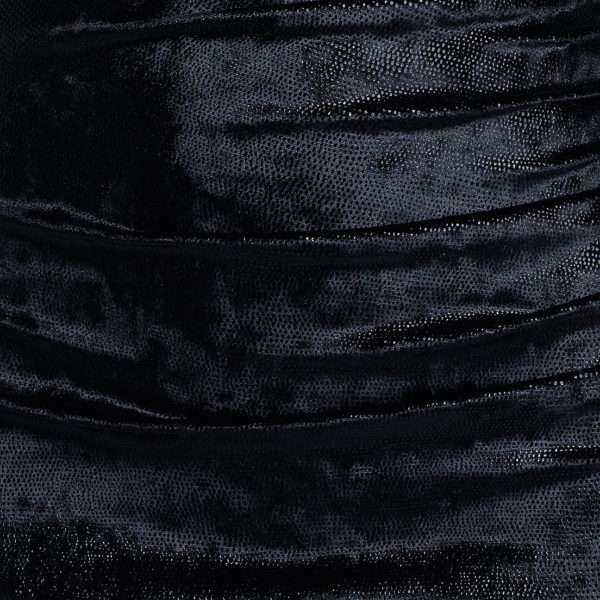 Ruched waist and rear for a great shape on a snake effect velvet stretch fabric. Wear to your next formal, prom, debs or black tie event. Kevan Jon Olympia serpent velvet ball dress. Vamp glam at its best in this stunning dark and sultry creation from Kevan Jon. The snake effect black velvet fabric is fabulous on the skin and has a shimmer effect in the light giving off an almost metallic wet look – a treat on the eyes. The styling of the dress is high slashed neckline with front keyhole bust. Ruching gives fantastic shape on the waist and rear and the tight long sleeves and cowl backless feature are a perfect contrasting combination. The dress has a train to the back and requires no zips. We feel this dress will be a treasure to your wardrobe and will give pleasure and style time and time again. Wear to your next formal, prom, black tie or debs.